Tropical Attititude Pets | Sugar Gliders Love It Here! Sugar Gliders are marsupials and are closely related to Kangaroo’s and Kuala bears. Sugar Gliders are indigenous to Australia and are in the marsupial family. They are not rodents. They carry their babies in a pouch and are more closely related to Kangaroos, Possums, and Koalas. The only thing they have in common with a flying squirrel is that they are close to the same size, and they do glide from tree to tree like a flying squirrel. They are more social than a flying squirrel. Squirrels are solitary animals and Sugar Gliders are colony animals normally living in groups of 10 to 20. 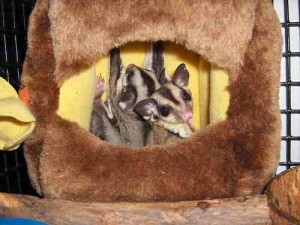 Sugar Gliders live about twice as long as flying squirrels, and are more social and trusting.